Yesterday keys exchanged hands and now someone else calls the place his own. As I surveyed the property of my childhood home — the home my mother lived in for more than 55 years — one last time it was surprising to feel not so much sadness and loss but rather relief. Weeds were everywhere and trees so overgrown as to block out views of the house and other buildings from the road. The house itself, badly in need of some tender loving care, looked tired and forlorn. Over the years it has just gotten too much for Mom to keep up. She said the work was more than she could handle. Knowing she couldn’t do the work herself and seeing how much needed to be done was bringing her down. Mom loves to tinker, to keep busy. She took pride in her gardens and her many bird feeders. These past few years, due to recent health problems and getting older, she was able to devote less and less time to her passions and now the new owner, a retired single gentlemen in his fifties, has his work cut out for him. Hopefully curb appeal is as important to him as it was to my mother and he’ll restore the place to its former glory. For Mom there was also the expense of keeping the old homestead running – the electric and heating bills for both her house and the apartments was astronomical compared to what they’ll run in the new place. 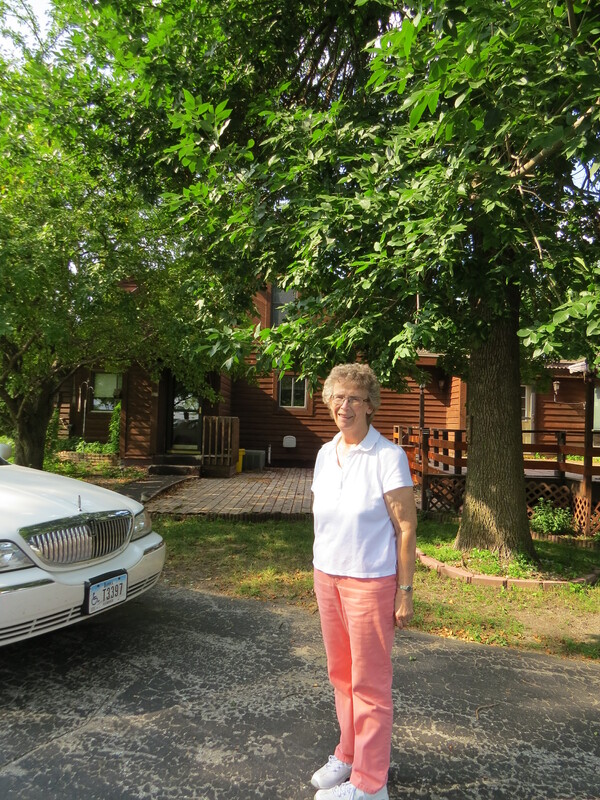 She had to hire out to help with the mowing and repairs and snow removal and that only added to her expenses. Property taxes were another consideration. There was also the isolation she felt at times being out there alone, especially in the winter months when an ill-timed blizzard could make her a prisoner in her own home for days on end. Yes. The time had come for her to leave. Once she made that decision the other pieces quickly fell into place. The new house is smaller and newer and yet it has five bedrooms, two of which are actually quite small. Three bedrooms are on the main level and two are in the finished basement. There is also a full bath in the basement and plenty of room for staging family get-togethers at Christmas and Thanksgiving. Four of us girls live out of town and the other two girls live not too far from Mom so the bedrooms will work quite well for our needs. She has a nice open kitchen with a breakfast bar, a place to set up her sewing room, a nice-sized patio and best of all closer proximity to all her friends. She is very excited about her new digs and all of us girls are thrilled for her. My mother is a busy woman. Not only does she have a new house now to settle in to but she leaves for Ireland in a week! You’re doing it right Mom. You’re doing it right! People often express surprise and a bit of wonder when I tell them I come from a family of six girls. The most common response is akin to expressions of sympathy for my dad. It’s true. He was certainly outnumbered but trust me when I say he gave as good as he got! He may have had, however, some inkling of what he was getting himself into when he married our mother since she herself comes from a family of eight girls. Not a male child in sight. Mom’s maiden name evokes an Irish heritage and St. Patrick’s Day is always celebrated with an exchange of feisty, funny cards and often a gathering in one of the sister’s homes. Irish décor can be found in every one of their houses and it goes without saying that green is a favorite color. My maternal grandmother was a little bit of a thing. Short and petite (lucky if she weighed 90 pounds dripping wet) she was blessed with a beautiful head of auburn hair. My dad loved to tease her and its amusing to me that one of his nicknames for her was the Old Battle Ax. (“Oh Richard” she’d say). My Grandma Monnahan did not have an easy life. Grandpa Monnahan struggled to support his family and often fell on hard times (he was a sawyer too and was instrumental in directing Dad toward that occupation – something my father did for fifty years and dearly loved). He died in at the tender age of 52, leaving Grandma to raise five daughters still at home, the three youngest under the age of ten. Sadness would strike a few years later when Grandma died in her mid-fifties as well. 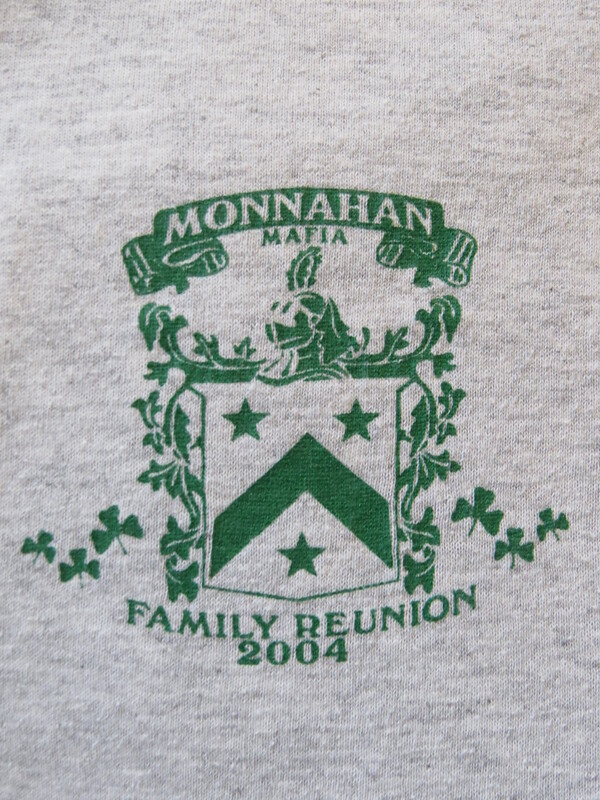 Despite these hardships, this clan of eight — dubbed the Monnahan Mafia by my Uncle Ole (most certainly not Irish!) – was and are a joyful bunch (the eldest, Geri, died a few years ago). Holiday parties, weddings and family reunions are a mix of crazy, zany, silly fun, fun, fun. Laughter — always laughter! These women love to cook and garden and some of them enjoy knitting and quilting. 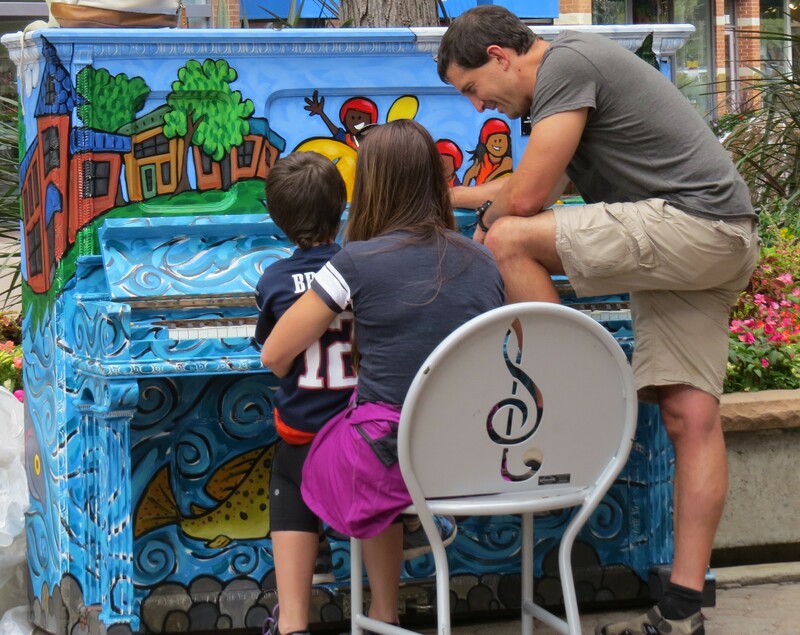 Music was an important part of their lives as well. Rosie plays the accordion, piano and organ. Nancy, the guitar. Linda played the trumpet and Randi, the French horn. A special memory is the eight of them singing Irish Eyes are Shining as they gathered around the piano for Mom and Dad’s 35th wedding anniversary. In August Mom and three of her sisters will travel to Ireland for the first time. I’m thrilled for them and can only imagine the mischief they’ll get themselves into. Mom and Rosie are in their seventies and the two youngest ‘girls’ are in their late 50’s / early 60’s. I am so glad they are planning this trip. It’s sad that they couldn’t have all gone earlier. In any case, these ladies are wicked fun and it will be an adventure of the highest order. The Emerald Isle may never be the same again! There are six girls in our family of which I happen to be the eldest. (Cue the snare drum — I also like to joke that while I’m the shortest of the bunch I also happen to be the cutest, smartest and most modest but I digress). To say that we’ve been close would be a bit of an stretch. Our familial ties have been strained over the years due to the usual sibling rivalries, petty fighting and misunderstandings. Add to the mix that each of us is so incredibly different from the others and it’s no wonder tension is sometimes in the air at holiday and other family gatherings. For many years I felt jealousy, resentment and not a little confusion whenever I observed sisters from other families who were close knit or who proclaimed to be ‘best friends’. What on earth was wrong with US I’ve often wondered. Over the last several years I’ve come to understand why the tension and distrust is there. And while I won’t delve into the reasons for our discord (let’s just call it family dynamics and leave it at that!) I am happy to report that our relationships have steadily gotten better over time. Not ideal but definitely improved. Two of my sisters and I spent a pleasant afternoon at a local winery today, joined by one of my sister’s friends. As we discussed some of our family history and the evolution of our sisterly bonds it was fascinating to learn that this woman’s family (and its underlying dynamics) weren’t all that different from ours. I recently chatted with another friend who reported similar disharmony between her and her sister. While it is sad to consider siblings not being each other’s greatest champions and defenders it’s also somewhat reassuring to know that my family — our family — is not so different from many others. Perhaps those Hallmark moments I’ve observed outside my own family circle that I yearned for all these years don’t tell the whole story. Things aren’t always what they appear to be. It’s gratifying now to reestablish our relationships with each other discovering mutual interests while respectfully acknowledging those areas where we otherwise part ways. We have that joint history together — rainbows, laughter, warts and all — good times and bad — that only us girls gets or understands. And in the process I like to think we’re making some new Hallmark moments to hold on to and cherish that will sustain us going forward.